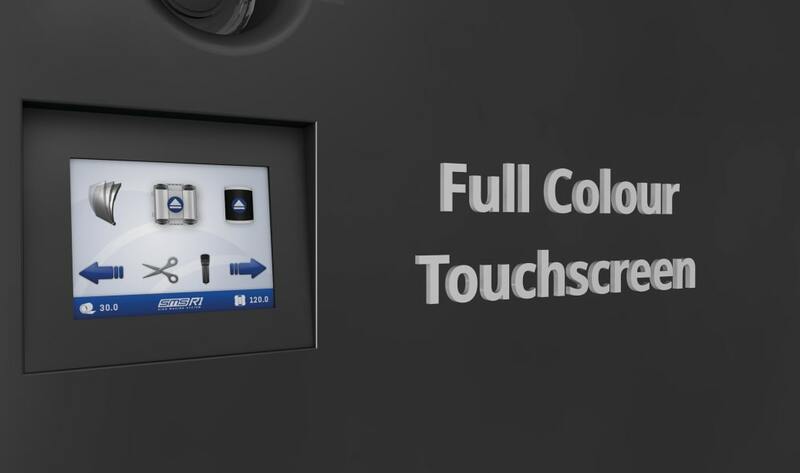 The new Rebo SMS-R1 colour and cut system is a rare development; the result of enhancing the features and benefits of existing systems and adding those wished for by the current market. 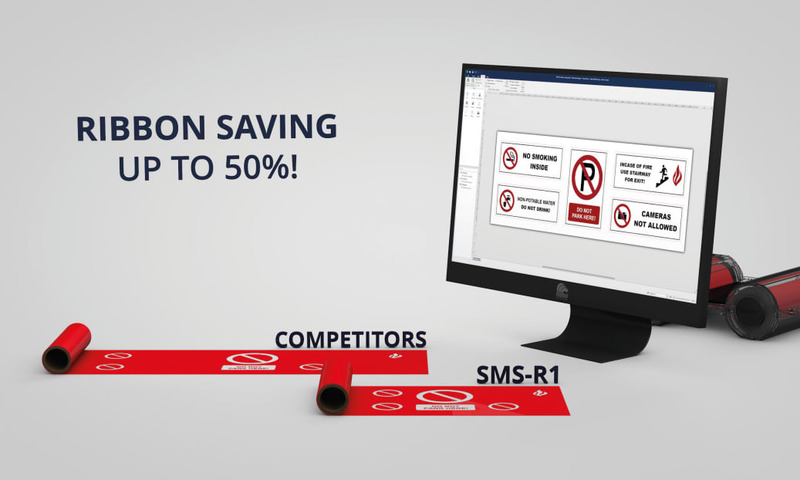 The SMS-R1 is a state of the art industrial sign and labelling system, a product increasingly purchased by companies determined to reduce costs and improve production and safety by producing durable and legal signs and labels in-house and on-demand. The SMS-R1 is unique in that it will print in multiple colours and, in the same process, cut any shape that is required. 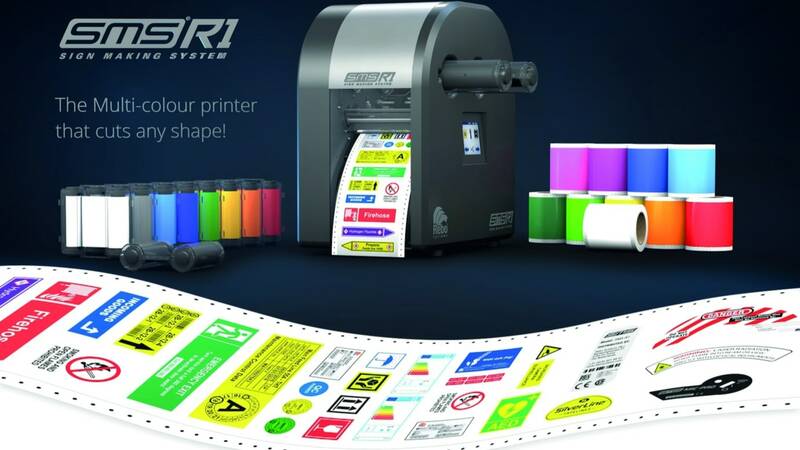 These functions allow users to create several different size and shape labels, with multiple colour, in a single operation and in varied quantities. Health safety signs can be produced quickly, with risk specific messages and in the required colours of the International legislations, in mixed quantities and in a single process. Technical labelling for equipment, maintenance, pipes and valves can be designed and printed in ones or multiples with individual or repeated characteristics. Rebo focused its development on cost saving, productivity, ease of use and quality. The SMS-R1 is probably the fastest device of its kind available, it has built-in ribbon saving and a unique print driver that allows any software to be used to create the original designs. Network and USB ports allow easy integration and resource sharing, and the SMS-R1 uniquely prompts the operator directly from the device – rather than the screen of the PC driving it. The complete operation – through to final delivery of the print and cut, ready to peel and apply labels, is kept within the system – no contamination is possible and the foot print is equally reduced, allowing the product to sit comfortably in any size work space. The materials used by the SMS-R1 are all industrial grade vinyl and polyester with an additional range of specialist materials for high temperatures, difficult surfaces and extreme environments. Health and Safety signs become easier to create and ensure they are applied on time, in the correct location and with the risk specific message often never found in catalogues. Self-created signs allow for multiple languages to be used, extra risk information to be applied and customised warnings that are specific to each, unique work environment. As a tool for creating visual communication in the work place, the SMS-R1 is enormously flexible and can be used for a myriad of applications – some quite unique and often very challenging. The key advantage will always be delivering what is needed, when its needed and at the right cost and quality.